Using phot ref taken from http://www.characterdesigns.com/ I have spent a lot of time this week doing studies of differnt facial expressions. 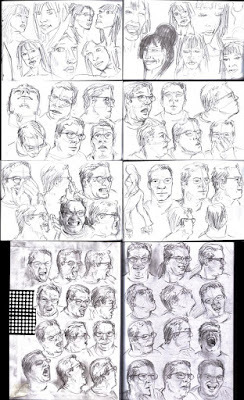 I need to spend longer on this, making sure that I can remain consistent in the facial proportions so I can maintain a likeness of the same face making different expressions - a lot of these studies look like they're of different people. This is somethingI need to address pronto, as in my forthcoming comic Persons Reported there are multiple characters whcih I shall need to ensure are clearly distinguishable at all times. In my rpevious comic, I only had 4 different charaters so it wasnt such a challenge.